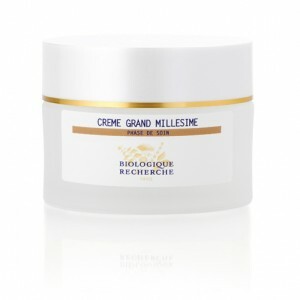 Crème Grand Millésime is a multi-function cream for devitalised, dull, and/or thick Skin Instants® which feel a need of rejuvenation. It contains our BR Grand Millésime complex to regenerate, witch hazel and cucumber to soothe, hyaluronic acid to moisturise and silk extract to soften. This powerful beauty treatment will intensely hydrate your epidermis, and improve your skin’s elasticity, leaving your complexion unified, revitalised and glowing. Devitalised and/or thick Skin Instants®. Regenerating and revitalising agents: Grand Millésime Complex, Cellular Oligopeptide. Soothing agents: Tepescohuite Extract, Witch Hazel Extract, Cucumber Extract. Moisturising and antioxidant agent: Hyaluronic Acid.